RICHMOND, VA (July 19, 2015)Â – For complete coverage please visitÂ www.topdrawersoccer.com. 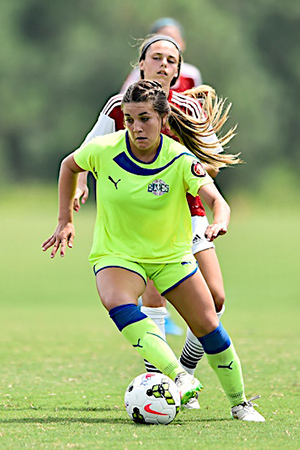 The final curtain fell on the 2014-15 ECNL regular season on Saturday, as the U15 through U17 national titles were decided under sweltering conditions in Central Virginia. Recap the action from Saturday as three clubs earned a fresh trophy to add to its case. Doug Swanson wasnâ€™t sure how his West Coast FC squad would respond this week at the ECNL finals. He said he brought a roster of only 15 to Richmond to play four games in five days in heat that would turn oppressive by the final day. And near the end of the final game against FC Stars, some of his players were struggling to get up and down the field. But West Coast FC held on to win the U16 title, 3-2. West Coast FC rolled through its first two games with a combined score of 11-4. A matchup with familiar foe De Anza Force loomed Friday, and West Coast FC scored late to earn a draw and clinch a spot in the final. Another battle, this time with FC Stars, awaited in the championship. The attacking combination of Sophia Serafin and Lake Duerkson caused problems for the FC Stars defense early in the run of play, but Duerkson scored on a free kick shortly before halftime for the gameâ€™s first tally. FC Stars quickly equalized in the second half when Mackenzie Viachos got open a run through the West Coast FC defense and beat goalkeeper Jasmyn Gordon. West Coast FC got back on top when Duerkson received a free kick and flicked it ahead to Serafin who finished easily. Serafin had a hand in West Coast FCâ€™s final goal when she drew a foul in the box and midfielder Remy Mathews converted the penalty kick. Led by forward Gabrielle Brummett and midfielder Kelsie Cummings, FC Stars kept the pressure on West Coast FCâ€™s defense as both teams tired. Brummett pulled FC Stars to within one after a botched clear in the gameâ€™s final minutes, but it was too late for FC Stars to mount much more of a comeback. PDA coach Meg Ryan knew that her team was â€œon a missionâ€ for a national championship. It had been something the players had talked about during their four years together, but there was something different before this year, a different sense of urgency propelling them forward through their tournaments. And in the U17 final, the work finally manifested itself in a championship â€” though it probably took a little longer than PDA was planning on. PDA downed Crossfire Premier on penalty kicks, 4-2, after the two teams finished 110 minutes of play tied 1-1. PDA goalkeeper Jordan Nash saved Crossfire Premierâ€™s final two penalty kicks while PDA converted all four of its attempts. Crossfire Premier controlled possession and pace early in the game, with its backline passing the ball among itself and forcing the PDA forwards to chase while searching for the seams in the midfield. Forward Madison Schultz almost put Crossfire up early after a streaking run but her shot was deflected off the crossbar. Schultz had a hand in another close call shortly after, but forward Asia Brisco and midfielder Holly Rothering couldnâ€™t connect on an initial shot and a follow, respectively. After Crossfire Premierâ€™s early attempts, PDA started to take control of the game. Forward Frankie Tagliaferri made runs at the goal and midfielder Nicole Whitley helped keep the ball in the attacking zone for PDA. Soon, PDAâ€™s persistence paid off just before halftime. Defender Rebecca Hamilton took a free kick on the right side just past midfield and launched the ball on a high arc toward the far post. Emma Smith was waiting, and she slipped the ball into the goal. Crossfire Premierâ€™s response didnâ€™t come until the final minutes of regulation. With a growing sense of urgency, the teamâ€™s attack became more pointed. Schultz gathered the ball in space on the left side, beat her defender and took an open shot. The ball caromed off the post, but landed at Briscoâ€™s feet, and she slotted in the equalizer. Schultz created another opportunity in the second extra time period after running around her defender on the end line and crossing the ball to open midfielder Kimberly Hazlett, but Hazlettâ€™s redirected spun wide. Then, it was on to penalty kicks, where PDA realized its season-long mission. Michigan Hawks had been no strangers to deficits and close contests during its first three games of the ECNL finals, winning each game 2-1 after falling behind by a goal early. So it seemed to be in good position in the U15 final when So Cal Blues scored the gameâ€™s first goal in the second half. But despite dominating possession through the gameâ€™s early stages, Michigan Hawks wilted in Richmondâ€™s stifling heat in the second half, and So Cal Blues captured the championship, 3-1. Early on, it seemed to be only a matter of time before Michigan Hawks broke through against So Cal Blues goalkeeper Lauren Brzykcy. But the UCLA commit made a pair of point blank saves to thwart the Michigan Hawks attack and keep the game scoreless. Brzykcy, whose long punting flipped the field throughout the second half, set the stage for So Cal Bluesâ€™s offensive outburst in the second half. About 10 minutes after halftime, midfielder Ashley Soto headed home a corner kick that had traveled through a chaotic scene in front of the Michigan Hawks goal. Shortly after, So Cal Blues defender Chloe Boice rifled in a shot from outside the box after Michigan Hawks attempted to clear one of her dangerous corner kicks. From there, So Cal Blues cruised. Sydney Duarte added So Cal Bluesâ€™s final goal on a breakaway after a long clearance by Brzykcy got by the Michigan Hawks defense. The lone blemish on Brzykcyâ€™s scoresheet came in the gameâ€™s waning moments, when Michigan Hawks forward Alexa Spaanstra powered a free kick past her. About Elite Clubs National League:Â Â The Elite Clubs National League (ECNL) was founded in 2009 to enhance the developmental experience of female youth soccer players in the United States through: (i) Improving the competitive environment through creation of a true national competitiv league; (ii) Improving the process for identifying elite female soccer players for the U.S. Soccer youth national teams through a systematic scouting and identification program based on national competitions; and (iii) improving the daily training environment at top female youth soccer clubs through developing best practices and training and organizational guidelines for its member clubs.Â The ECNL is sanctioned by US Club Soccer and is sponsored by Nike Soccer. Watch the ECNL National Finals on the ECNL Network!